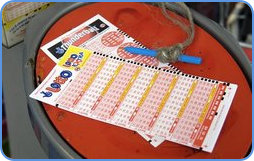 The UK Thunderball lottery first drawing took place in June 1999. 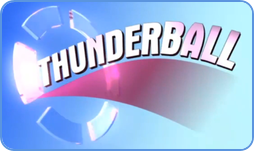 Thunderball draws was entertaining players on every Saturdays and Wednesdays. In May 2010, Camelot - the lottery company changed the rules by setting up a ninth prize category for the Thunderball, and adding five more numbers to the original guess set. Now, the guess range is of 1-39. On the right picture: Thunderball logo used in TV draws. The other changes from May 2010 includes a third weekly draw that was added and take place every Friday, and the jackpot figure was doubled from a fixed prize of £250,000 to a fixed prize of £500,000. The UK Thunderball lottery has been distributing jackpots since 1999, and the fixed £500,000 first prize means more money in prizes for lower categories of winnings. We must say that Thunderball is not the most popular lottery game in the United Kingdom. The UK Lotto is - the UK version of American Powerball lottery that regularly adding fever to lotto players because of jackpot roll-overs feature. On the left picture: The UK Lotto and Thunderball blank coupons play-slips. Thunderball is a typical lottery game of chance and it is very easy to play this game. Player just select five unique numbers from a guess range of 1-39 and one additional number from a guess range of 1-14. This additional number is sometimes called the Thunderball or Premium Ball and enables players to win lower division prizes and is necessary to win jackpot (first prize), as well. Local and international players love lotteries like the UK Thunderball because of its favourite winning odds that guarantee 1 out of 29 players will become winner of at least the lowest prize division. Smart lotto be-lovers know that the odds of winning the Thunderball's jackpot are some of the best in the world! On the right picture: Thunderball lotto draw machine in TV studio. You have to select five main numbers from a range of 1 to 39 and one additional number from a range of 1 to 14. Draws take place three times in a week, every Wednesday 22:30, Friday 20:55 and Saturday 19:30. 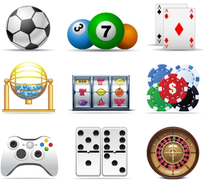 Thunderball prizes are paid in a cash lump sum (a one-time payment) and are tax-free. The best odds of winning of the one of the smallest prizes in Thunderball are as 1:29 and you need to hit only bonus winning number to win this mentioned 9th division prize. Thunderball offer the possibility to win many of the medium and small prizes. That's very good news for regular lotto games players. However, if you want to win the first prize, mean Thunderball jackpot, the odds of winning are as 1:8,060,598. You will find the winning odds table on the right. It shows all odds of winning in all divisions available in this Thunderball lottery game of chance. Please check the latest Thunderball Lotto results, upcoming next draw date and upcoming jackpot figure, right below or at the beginning of this page. Thunderball Lotto is available to play from any place in the World, using credit card, debit card and other electronic payment methods, including PayPal, Skrill/Moneybookers or bank transfer. If you can’t get to the United Kingdom in person, you can buy Thunderball Lotto tickets online, easily, simply and fast. All you have to do is to click "PLAY" above, or please click the link below. 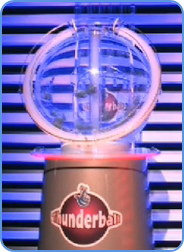 You should know that the UK Thunderball game is one of the British lotteries that takes part in the National Lottery Awards show. In fact, UK lotteries raise an average of £30 million each week for the Good Causes fund. By playing Thunderball, we all help each other by various ways. The National Lottery Awards event recognizes the achievements of the best British lottery funded programs. Please watch Leona Lewis performs 'Lovebird', a track from her new album 'Glassheart'. Taken from the National Lottery Awards show that was broadcast on 8th of December 2012.